I've started doing this thing where I buy clothes on a sale at the end of the season and kind of kick myself thinking I should have just spent a little more money and bought something I can actually wear for the upcoming season. 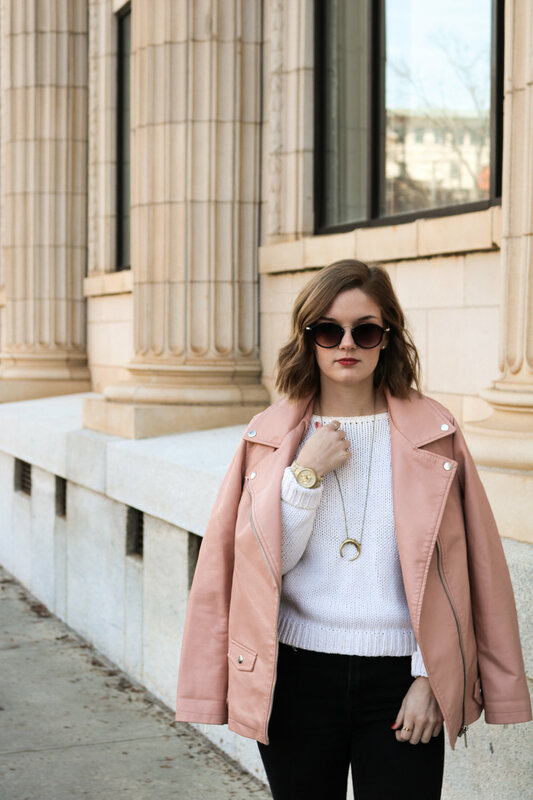 Long sob story later, I realize I can find some great gems this way, like this pink, oversized, faux-leather jacket for only $13. These boots are so fun and comfortable. It's gotten to the point where I will start my whole outfit based on the boots because of how easy and comfortable they are to walk in. Also, I finally replaced my $3 H&M sunglasses (that were tragically lost at the Clemson Carolina game) with these $10 H&M sunglasses. If you're looking for good skinny black jeans that won't kill you to buy, these forever21 jeans are some of the best. They are high waited, slightly cropped, and not super "lenty". I've linked them underneath the photos! When it's still in the 70's during SC fall, you need some good fall finds that can take you right into chillier weather. This look is an easy, run around the town outfit that is comfortable and super affordable. It's okay to go a little ~extra~ on a Tuesday. The 4th of July is one of my favorite days of the year, which seems kinda funny to say, but it's true! I love the fireworks, spending time with family and friends at the lake or at the beach, being in the sun and just enjoying the summer. This was one of my favorite shoots I've had so far. The girls and I were goofing off and playing paparazzi for each other in downtown Greenville. The funny part is I didn't even intentionally mean for it to be a 4th of July outfit, it just kind of happened. I had just gotten these star sandals and red, Free People dress and thought they looked good together. Then I threw on the denim jacket last second and there it was, stars and all. Matched with my navy backpack, it was like I planned it all along. Scroll to the bottom for outfit details! This outfit is a go-to for long days where I'm out, running around and trying to be comfortable. This jumpsuit is so easy and comfortable. The cropped pant and the high-waited draw-string is flattering on anyone. It's easy to wear with wedges and a long cardigan to go out at night or just like this, to roam around the city! The jumpsuit is from Entourage Clothing, where everything is $42 or under so it was even well priced!